Note: The Daily Mirror HQ recently acquired another issue of Haldeman-Julius Monthly with another piece by Louis Adamic, author of “Cecil B. DeMille: Movie Evangelist.” Here it is, courtesy of the OCR software of the HQ’s scanner. THE Reverend “Sister” Aimee Semple McPherson’s factory of moron faith, the be-oo-ti-fool Angelus Temple, situated on the shore of Lake Echo, beneath the benign sky that daily spreads like an azure canopy over the city of Los Angeles, is these days in a lamentable plight. Its predicament is, in a general way, analogous to that of a backhouse in a Nova Scotia storm. Not that its walls of concrete and steel have begun to crumble-I hasten to allay your alarm. Photo: The Rev. Aimee Semple McPherson after her return to Los Angeles. No, they still stand as stoutly as ever, and from the roof of the temple there still yearn heavenward two slender masts joined by a sheaf of magic wires, by means of which the Holy One within inflicts herself upon sinful ears in Radioland. Outwardly everything is just as it always was. The surface of the little lake across the way is smooth -and restful to the eye; the trees along the pathways in the park rustle as gently and irrelevantly as has always been their wont, though now and then one would think there is a more pronounced note of mirth in their whispering. Even inside the great plant there is but scant change. “Sister” Aimee–glory be!–is back and the factory operates full blast, from early morning till late evening; indeed, up in the “watch tower” prayer never ceases. Twice and three times each day Aimee preaches the Four Square Gospel and praises GEE-SUS in her matchless way, not forgetting, of course, to rake in the mazuma that her customers eagerly toss her way. But appearances are notoriously deceiving. As a matter of fact, the be-oo-ti-fool Angelus Temple is in an awful tempest, for, dear hearts, the Devil–the clever, foxy old Prince of Darkness–has loosed his winds of hate and slander, commanding them to blow about the auburn coiffure of the much beloved “Sister” McPherson, his most formidable opponent on earth. The ways of the Dark One are subtle. One can never tell how he may work his schemes. For some time it was an open secret that he was casting malicious leers at the Angelus Temple. For three long years he left her in peace, but all the while, perhaps, cooking up a plot. Indeed, I know that he was giving the matter a great deal of attention. If you promise, dear hearts, to tell no one, I’ll disclose a personal secret. Shortly after my first article on the rev. lady appeared in, the `”Haldeman-Julius Monthly,” [January 1926: See also February, July and August 1926 issues] the Evil One himself came to me and we discussed the matter at great length. Modesty being a Christian virtue, I will unblushingly remark that the Prince was immensely pleased with my effort and, of course, with the “Monthly” in general. Could I make any suggestion as to how to get rid of Aimee? I scratched my head once, twice, and then proposed that he bore a hole from Hell straight up to the Angelus Temple and smoke Aimee out, and then turn the building over to Haldeman-Julius, to be used as a warehouse and distributing center for Little Blue Books along the Pacific Coast. The Evil One seemed fairly taken with the plan at the time; it appears, however, that since then he decided not to employ such direct methods–for the Devil, like his singular antagonist, Jehovah, is a sly one, as a rule preferring to do his dirty work through his agents. I haven’t seen the Devil since, though I hope to soon; so the account of the plot whereby he is apparently trying to undo Aimee is not “inside” information; it is, for the most part, a resume and interpretation of reports that I have received from various sources, including the rev. Aimee herself. Everyone promptly believed that she had not drowned, but only a comparative few seemed inclined to swallow the “kidnap” thriller–few, that is, outside of her Angelus Temple and Radioland customers, whose number runs, perhaps, into a hundred thousand. For, you perceive, the Devil, the shy old spider, was on the job, injecting into the public mind the notion that Aimee had played a hoax. The Evil One employs all sorts of tricks to ball up the works of the Holy Ghost. Aimee’s yarn was a thrilling one, fit for some such organ of enlightenment as “The Danger Trail,” wild and woolly; but, somehow, it did not seem to hang together, especially after the police on both sides of the border, a couple of “desert rats,” and other such special agents of the Dark One, picked it to pieces. Well, the “Sister” returned to Los Angeles. And never, never has the city seen a demonstration to equal the one occasioned by Aimee’s arrival, and perhaps it never shall. I think the Chicago Eucharistic show was a flop beside Aimee’s homecoming. Tens of thousands of people gathered at the depot and perhaps a hundred thousand lined the “Avenue of Triumph,” that leads to the temple. Should the hon. Calvin Coolidge, or the Pope of Rome, or Billy Sunday, or some other such great one arrive in the city, I swear he would get but the merest shadow of the reception that Los Angeles rendered Her Majesty, Queen Aimee of Moronia. Straightway Aimee turned to her business, for the customers were clamoring for goods, while below the border a posse of simple fellows were hunting for the “kidnapers” and the “shack” in which she had been “held captive.” But there was no shack. The shack,, the shack find the shack! So Aimee up and journeyed to Sonora to find it. A whole day she drove in an automobile from shack to shack, but none would jibe with her description of her particular “shack.” However, she located some “footsteps” thirteen miles from Agua Prieta–whose footsteps, she did not say. On her way from Sonora to Los Angeles she paused for a moment at Douglas, Ariz., where she had been recuperating a week before from the terrible ordeal incidental to her “kidnaping” adventure, and as a crowd gathered at the station, Aimee, naturally, could not resist making a speech. Oh, she was so grateful to the people of Douglas for what they had done for her in her hour of trial; they were just wonder-fool. “How many of you would like to have me come here and start a Four Square Gospel church?” she asked. “Put up your hands, dear hearts!” And what do you think?–up went one solitary paw and the one belonging to the taxi-driver who had made $30 driving the lady around. In other words, the Evil One was busy in Douglas, too. The shack, the shack … well, it could not be found. Perhaps the Devil had removed it, afraid that if they should find it Aimee might build a temple on the spot. He is a sly one! Aimee returned home again and the next evening unrolled before the congregation at the temple a blueprint, which she said was a map of the desert through which she had escaped the kidnapers, showing the footsteps and everything, though no one was close enough really to see it. For all I know, it might have been a map of Poictesme. Outside, however, the town talked and giggled and laughed–indeed, it seems (I received several hundred letters about this case from readers of the “Monthly”) that the entire country, from Maine to Oregon, talked and laughed and giggled. For instance, motion pictures of her homecoming would be shown in Los Angeles theaters and the crowds would jeer and roar. Vaudeville comedians manufactured double-meaning jests about her, and the crowds were grateful for them. But theaters, of course, are notoriously places of the Devil. In the public mind the whole affair was a hoax, funny, sad, outrageous, incredible; only her own people, of course, believed her “kidnaping” yarn. It was a deep mystery, a fascinating case, full of hot, juicy possibilities. And wag, wag, wag went the tongues, millions of them; literally everybody who was not dumb talked about it. That is an interesting and significant part of the thing. The newspapers, naturally, cashed in on the excitement; in fact, they are still cashing in on it. At first they were cautious; they did not know just how the affair would swing, but as the anti-Aimee feeling increased, they, too, became tools of the Devil. Also, along came Aimee’s rivals in the holy business, the preachers, who, assembled in a special meeting of the Los Angeles Church Federation, passed a solemn resolution calling upon the authorities to straightway institute a through investigation, issuing a warning that any attempt to whitewash anyone implicated in the case would not be tolerated. So it seems that, for the time being at least, these holy men, too, joined hands with the Evil One to overthrow the Queen of Morons. One fighting whooper of the Word was reported to have remarked that “the skids already were greased for Aimee.” The attitude of the preachers is easily understood: Aimee’s church has been getting too many customers to suit them. Why would kidnapers use two different typewriters to write one epistle, as was done in this case, giving investigators the double chance of finding one of the two machines? “Ma” Kennedy turned the letter over to the detectives on June 23, the day after Aimee’s “resurrection from the dead,” stating that she had not read it until the previous afternoon. Can you imagine one letting a special-delivery letter lie on one’s desk for three whole days Especially with a “beloved” one “missing”? Another significant fact in this connection is that the special-delivery stamp was removed from the. “Avengers”‘ envelope and replaced by a canceled two-cent stamp. Assuming (as I think one is justified to assume) that the letter was written by someone in Aimee’s confidence, if not by herself, in order to pave the way for her reappearance, there apparently was a lack of team-work between her little party in Arizona or Sonora and “Ma” Kennedy and her staff at the Angelus Temple, to say no more about the bum technique of the letter-writer. The scheme was bungled terribly. OF course, a female mystery without a man in the plot is like–well, like boiled cabbage without corned-beef, or like a Hearst newspaper without a few pictures of crossed female legs: a thing wellnigh inconceivable. In His great wisdom, the Lord has so arranged human life that in the life of every normal woman there always is one man or more; and vice versa-which no doubt is just as it should be. Now, in the case of our rev. she-mullah, it seems that once upon a time she had in her employ as engineer-in-chief of her radio plant a stalwart he-man by the name of Kenneth G. Ormiston. The fellow was respectably married, but after his connection with the Angelus Temple the wife threatened to sue for divorce, and to name the rev. Aimee as the “other woman.” Things, however, were patched up and the unhappy spouse of the radioman was shipped to Australia. A short time before Aimee’s departure for the Holy Land Ormiston quit his job–why, it has not been stated; perhaps to study radio doings abroad. There is no reliable record of his movements until about three days after Aimee’s “drowning” at Venice on May 18, when the authorities traced a huge money-order that Mr. Ormiston had received from a mysterious source. He was then in San Francisco, and upon hearing of his name being linked with Aimee’s and her disappearance, he up and came to Los Angeles to “clear up” things–so far, at any rate, as they concerned him. He did “clear up” things to some extent and a day or two later mysteriously vanished again. There has been no trace of him since, except that, on May 19th, when Aimee was supposed to have been drowned, he–or someone who, according to handwriting experts, has a hand identical with his–filed a telegram at Oakland, California, signed “Dr. Murden,” notifying the evangelist’s mother that Aimee was “O. K.” The telegram was composed so as to give the idea that the sender was a spiritualistic medium who had been in communication with the Great Beyond. Perhaps this was “Mother” Kennedy’s authority for her statement that Aimee was “in the arms of Jesus.” Anyway, “Ma” admits that she received the telegram and insists that she turned it over to the detectives immediately upon receipt, while the latter claim to have no knowledge of it whatever. And two employer of the Western Union office at Oakland declare that the man who sent the wire was the original of Ormiston’s picture in the newspapers. As I write this, the sleuths are said to be hunting for Ormiston all over the country. The idea that has taken hold of the public mind is that Ormiston is the key to the solution of the mystery. If he is not, then why does he not appear and “clear up” things as he did after the “drowning”? There is no doubt that the fellow knows about his name now being linked to Aimee’s, as it was then. A few days ago a newspaper reported that on the previous evening, in the course of a radio sermon, Aimee irrelevantly cried out, “Run, run, run! Go fishing!” I haven’t heard her; but if she did, it proves that science certainly is wonderful. Also, several people have come forth claiming that they have seen Aimee, either in company with other people or with Ormiston, in various parts of California and Sonora. One man declared under oath before the grand jury, and in the presence, of Aimee, that she was the woman he had seen, five days before her reappearance, in front of a saloon in Agua Prieta. ON the day Aimee was subpoenaed to tell her yarn to the grand jury several thousand people gathered at, and along the streets leading to, the Hall of Justice, so-called. Most of them were her followers. As her car drove by, up went the old, gnarled hands of her “dear hearts” in a “Fascist” salute, and at the entrance to the Hall of Justice was a platoon of the best-looking female student-evangelists of the temple, ladies-in-waiting to the Queen of Moronia, dressed in the costume of the court. “I am a lamb going in to slaughter!” cried the rev. “Sister,” moved to tears by this display of loyalty on the part of the “dear hearts,” though, of course, to a low-life creature like me it was apparent that this demonstration was largely prearranged. To the jury she repeated her “kidnaping” tale–under oath”word for word,” as she reported to her congregation at the temple in the evening. She and “Mother” Kennedy were tickled to death that the grand jury was investigating the case: that would put an end to the wild and indecent talk that was going about town. But, instead of doing that, it became worse. The district attorney and his deputies–agents of the Devil, every blessed one of them–were beginning to bring up no end of people who insisted that they had seen Aimee, or exact duplicates of her, at various places in California and Mexico between May 18 and June 22. As I write this (July 19, to get my copy in for this issue) the grand jury investigation is still on, but it seems that those in a position to end it with an unconditional victory of Satan, are weakening. At the moment it looks as though they will not go to the bottom of the mess, which, perhaps, would be too far-reaching in its consequences if entirely exposed. I have followed the case as carefully as, perhaps, anyone outside of the official investigators; I have let the diverse facts, theories, rumors, and appearances filter through my mind, and the residuum that stays with me is the belief that Aimee was no more kidnaped than I am an incognito shah of Persia. The only way she can convince me that she made that fifteen or twenty-mile hike across the desert without a drink of water and without getting sunburned, without wearing out her shoes and tearing her clothing, is to do it all over again, and let me ride behind her in an automobile equipped, among other things, with a huge canteen of water; and if she asks me for a single drink or a lift, I’ll give it to her and then laugh right in her face. It is possible that by the time this article appears in print the rev. “Sister” will be in even deeper trouble than she is now, poor wretch; but, as it looks now, I don’t think so. The skids, as her sweet-natured brother-preacher has said, may be greased for Aimee, but I don’t believe she’ll go skidding. It looks as though she’ll get away with the whole thing. .
And, personally, I don’t care if she does. What difference does it make? If she is dethroned as the Queen of Moronia, what will become of her subjects? They must have a queen or a king to look up to, to be inspired by. If the Devil deprives them of Aimee, they shall before long develop another Aimee, male or female. A few days ago I was talking with an intelligent, serious-minded though somewhat befuddled young woman who, like myself, is satisfied that our heroine has played a hoax; her sense of decency is outraged thereby, yet she hopes that the authorities drop the whole matter and let Aimee preach her buncombe; she does not want Aimee entirely exposed and feels that the thing has gone too far already–because she feels sorry for her followers. The young lady believes with me that the rev. Aimee fills a human need; her followers get more for their money at the Angelus Temple than they could get from any other preacher in the business, Billy Sunday not excepted. That is why she has the largest congregation in the country; that is why she has daily a matinee and an evening show, and performs three times on Sundays. The people of Moronia want her to do what she is doing; she is a good queen to them. (And, of course, the rules of conduct that apply to the milkmaid do not apply to the queen.) Aimee keeps them pepped up; her magnetic personality vibrates through their poor souls, and she knows every trick of the game. One can have no idea how efficient she is in front of the congregation unless one visits the temple and sees her in action. With a single gesture of her hand–the most expressive hand I have ever seen–she can dredge their souls from the mire and misery of their reality and lift them into a glittering heaven of illusion. While they wait for her to appear on the platform they tremble with anticipation; and when she does come out and waves them a greeting, their faces light up and their own hands go up in a Fascist salute. What would become of these living people who are already dead, should Satan send Aimee skidding down to shame? Personally, I am not greatly concerned for them, but a multitude of intelligent people are; and I believe that their attitude will prevail and allow Aimee to go on preaching four-squarely. My attitude may be cruel although perhaps it isn’t. Nietzsche said somewhere something to the effect that cruelty is but a form of mercy. I don’t care either way, and it wouldn’t matter if I did; this is a war between the Holy Ghost and Satan, and my caring or not caring would not help either side. I am satisfied to watch and laugh and write about it. MAYBE I am too flippant about this affair. Maybe I am in bad taste writing about the woman as I do. I know that the whole thing is very sad; there are moments when I am sorry even for Aimee, but one can’t be sad and sorry all the time-one must laugh at life in self-defense. Besides, I think the case is tremendously interesting psychologically. Her followers fascinate me as much as Aimee does. She has lost very few of those that she had “saved” or “healed,” those who worshiped her as a sort of divinity; she has lost, however, a great many distant admirers. In the town where I live is a man who would not speak to me because I had written the article on Aimee in the January, 1926, issue of this magazine. He wanted to quarrel with me over it at the time, and he told me what good work she was doing, and so on. Since then I met him every week, once or twice, and he always looked the other way–until three weeks ago, when he hailed me with a cheery goodmorning and asked me to step in his store. He told me he was “off of Aimee for life” and began cursing her roundly. Just to be contrary, I took Aimee’s part, and so we almost quarreled again. But to return to her devotees. About a week ago I attended one of the evening services at the temple. I went there primarily to buy the picture of the rev. “Sister” that embellishes this article. The temple was full, but I suspect that among the followers was a goodly scattering of curiosity-seekers. The “workers” and student evangelists are carefully distributed over the entire place and seem to be anxious to engage in conversation with the customers. If they find that one is inclined to be skeptical about Aimee’s story they try to set one right. They emphasize such words as “kidnap” and “kidnapers” and stress such obvious facts as that the Mexican police as well as the local authorities, not to mention the newspapers, are working with the Devil to undo the beloved “Sister,” to disrupt this beautiful place of devotion. Aimee appears in company with her mother. It seems that “Mother” Kennedy is on the platform with Aimee at every performance. Personally, I think the old lady is afraid that Aimee is apt to fly off the handle again and do something rash, perhaps tell the whole outfit to go chase itself. I must not forget to mention that one of the former students of the temple–a young woman–has testified before the grand jury that shortly before Aimee’s disappearance on May 18 she was a witness to a violent quarrel between the “Sister” and “Ma” Kennedy. During the quarrel, which concerned, it seems, some money matters and such delicate things, it is alleged that “Ma” Kennedy took a good slap at the evangelist, whereupon the latter told the old lady that if she thought she could run the temple without her, she was welcome to it. This, perhaps, is the best explanation of Aimee’s disappearance. ‘ But be that as it may, “Ma” Kennedy now is on the platform with Aimee at every service, which was not her wont before. The band plays a jazzed-up piece of holy music. Loud and prolonged laughter. Somehow, I can’t laugh. One of the female “workers” sitting on my right is laughing herself red in the face, and observing my gloomy countenance, she manages to remark to her companion: “I bet half of the people didn’t get the joke. Oh, it’s the funniest joke I ever heard!” and she laughs some more. Having thus put them in good humor, Aimee leads in singing “I Ain’t Gonna Grieve the Lord Anymore,” which is a sanctified barroom ballad. Then a long prayer by “Ma” Kennedy, followed by a number by the choir, followed by a piece of band music, followed by a little yodeling on the part of a couple of male “artists,” followed by the collection, followed by announcements, etc., etc. ACCORDING to the Angelus Temple statistics, Aimee’s business has been better since her “escape from the kidnapers” than ever before. Previously she used to convert about fifty or sixty people a night; now her average is well past one hundred. Previously she used to baptize–that is, duck in the tank of the Holy Ghost-twenty or thirty people each Thursday; last Thursday she immersed one hundred and thirty-six. So the future of the faith factory looks bright. But I have a sneaking notion that Aimee won’t be with it much longer. She is tired of it. She is eager for an opportunity to make a good exit. She wants to travel, and she will. She is financially dependent upon the temple–she can’t sell it like one would,, say, a soap factory or a fish cannery–so she must stay with it, for the time being as its active head, later its head “in absentia,” returning to it every once in a while for, say, a month or two at a time. The sudden quashing of the investigation and incidentally of the presentation of any further evidence or testimony is undoubtedly damaging to Aimee’s interests, in spite of the fact that the sudden cessation of proceedings is due indirectly to conservative public opinion, opposed to a thoroughgoing investigation because fearful lest it do possible damage to religion in general. It is quite probable, also, that the stopping of the investigation is due in part to the fear that it might bring about shocking disclosures, such as those suggested in my article. The closing of the McPherson case is directly due, of course, to political influence brought to bear on legal machinery. Thus, the officers of the law, unconvinced that there were any kidnapers, will not make fools of themselves chasing some will-o’-the wisp. Aimee says she was kidnaped. Her authority is, unfortunately for her, not recognized by the grand jury as adequate. If there were grand juries in the time of Jesus, it is quite possible that certain other myths would have been shown, at their inception, to be unsubstantiated by facts. Or, were there no grand juries today, would Aimee’s hoax be “gospel” truth two thousand years from now? I wonder. IT seems, at the last moment, that the devil is getting the best of Aimee. This contest with Satan is not going at all well on the side of the Four Square Gospel. There is now a report that positive proof has been secured that for ten days following her disappearance, Aimee Semple McPherson and Ormiston, her radio announcer, occupied a bungalow at Carmel-by-the-Sea. The authorities, in the face of this new evidence, are forced to reopen the investigation. This may bring about an indictment for perjury, since Aimee told her “kidnaping” story, to the grand jury, under oath. Satan, devil that he is, is probably rubbing his hands gleefully and smugly warming them before his fires. 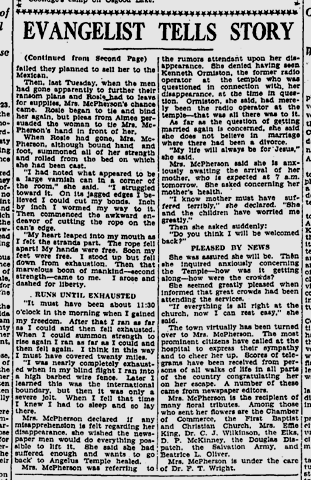 This entry was posted in 1926, Crime and Courts, Louis Adamic, Radio, Religion and tagged #1926, #Hoax, #Kidnapping, #Louis Adamic, Aimee Semple McPherson. Bookmark the permalink. Prior to 1932, kidnappings were not investigated by the FBI, but handled locally, with all that implies politically and economically. While many people today believe Aimee Semple McPherson pulled off some sort of hoax in 1926, it is interesting to note 3,500 pages of court transcripts, funds amounting as much as 2-3 million in 2013 dollars, the largest case of its kind in the history of California to date and they found—-nothing. They could not prove McPherson’s kidnapping story false. McPherson acquitted. BUT, The California State Senate tried again a few years later, and another 1,300 pages of transcripts with perhaps as much as 3/4 of a million dollars in 2013 money spent — more NOTHING. Most of the costs in both cases were covered by the newspapers which recouped their invested funds many times over in sales, and left the taxpayers off the hook. The Court of Historical Review and Appeal in San Francisco, which holds no legal authority, is made up of members of the bench who examine and retry historical cases and controversies. In April 1990, a decision was handed down regarding the matter of McPherson’s kidnapping story. George T. Choppelas, the then presiding judge of the San Francisco Municipal Court, ruling for the Court of Historical Review, found the issues involved both serious and fascinating. He concluded that “there was never any substantial evidence to show that her story was untrue. What would have occurred if, in 1926, they investigated the possibility of her story being true instead? There is no part of her story that in part or in whole that was implausible. I believe she knew one or more of the kidnappers whch were members in her church. They lured her with a request for healing or some front spiritual assistance, Otherwise she would not have have voluntarily left the public beach area to go near the kidnappers vehicle. This is delightful. Louis Adamic was a treasure.